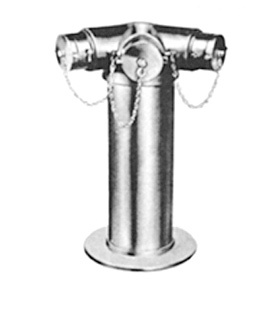 Sidewalk hydrants are available with 4" or 6" inlets and 2 or 3, 2 1/2" outlets. Standard cast brass. Polished brass or polished chrome optional. The assembly comes complete with cast body, 18" sleeve, escutcheon plate and caps. Threads to local Fire Department.